GE Intelligent Platforms have announced the SBC622 rugged 6U OpenVPX-compliant single board computers. Based on the powerful Intel Core i7 Processor, it provides a unique combination of innovative technologies that deliver unmatched performance, flexibility, connectivity and compatibility. It is designed to play a key role in the rapidly-developing field of network-centric warfare in programs such as FCS (Future Combat System) and JTRS (Joint Tactical Radio System), in which data driven architectures enable warfighters to gain a more complete realization of the battlefield environment. Typically challenging applications include early warning systems, command and control, and the aggregation, analysis and dissemination of real time sensor data including radar, sonar and video in air-, sea- and ground applications. Such applications demand outstanding processing capability, comprehensive I/O and communications and absolute reliability. At 2.53GHz, the SBC622’s Intel Core i7 processor is 30% faster than its predecessor, while double the memory capacity – up to 8 GBytes of soldered DDR3 SDRAM with ECC - of first generation VPX single board computers further enhances performance. Optimum scalability and interoperability are delivered by the SBC622 single board computers’s high bandwidth10 Gigabit Ethernet I/O fabric subsystem. 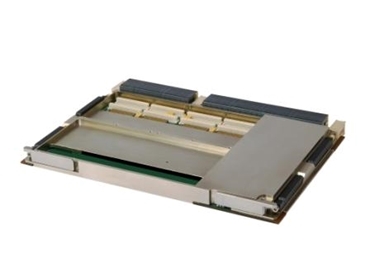 Customer flexibility to configure the SBC622 single board computers according to the precise requirements of the application is delivered via two on-board PCI-X PMC/XMC mezzanine expansion sites. Compliance with the OpenVPX standard ensures that the SBC622 single board computers is interoperable with a broad ecosystem of solutions, minimizing develop time and cost and accelerating time to market. Available in five rugged air- and conduction-cooled build levels for optimum cost-effectiveness, the SBC622 single board computers is fully supported by comprehensive Deployed Test Software (BIT and BCS) while operating system support for VxWorks, Windows and Linux gives customers the choices they require. Provision for a higher degree of failsafe operation is delivered through the SBC622 single board computers’s on-board BIOS Flash which can be optionally backed with a second Flash device = providing a level of safety for recovering the BIOS if the primary BIOS becomes corrupted. For ease of use, the Flash device is large enough to optionally host additional pre-boot applications such as Built-In Test (BIT).